Joints are movable connections of bones so that we can move freely. The condition of the joints is influenced by many factors. Nutrition plays a very important role in ensuring the proper functioning of the joints. A properly selected diet not only supports their proper functioning but also reduces arthritis pain and accelerates the regeneration period. To ensure good condition of the joints, regular exercise should be performed. Mature age and overload during intense exercise are common causes of joint damage. Excessive weight also has a negative effect on the condition of the joints, which causes excessive strain on the joints and significantly weakens them. Both in treatment and prevention for healthy joints, a properly chosen diet is very helpful, which complements the shortage of components responsible for the condition of our joints. When planning a proper diet you should pay attention to a number of nutritional recommendations. Dieticians point to the risk of many diseases, following a diet rich in fatty acids and cholesterol. Enriching the diet with a sufficient amount of nutrients that contain mono- and polyunsaturated fatty acids causes a reduction in LDL cholesterol in the blood and improves cardiovascular health. A properly balanced diet, which contains a rich array of healthy products, is definitely more beneficial for our body than a diet based on just a few nutrients. Protein is invaluable support for proper functioning of joints. This is a necessary ingredient for building new tissues and muscle structures. High-quality protein is a constituent of synovial fluid. 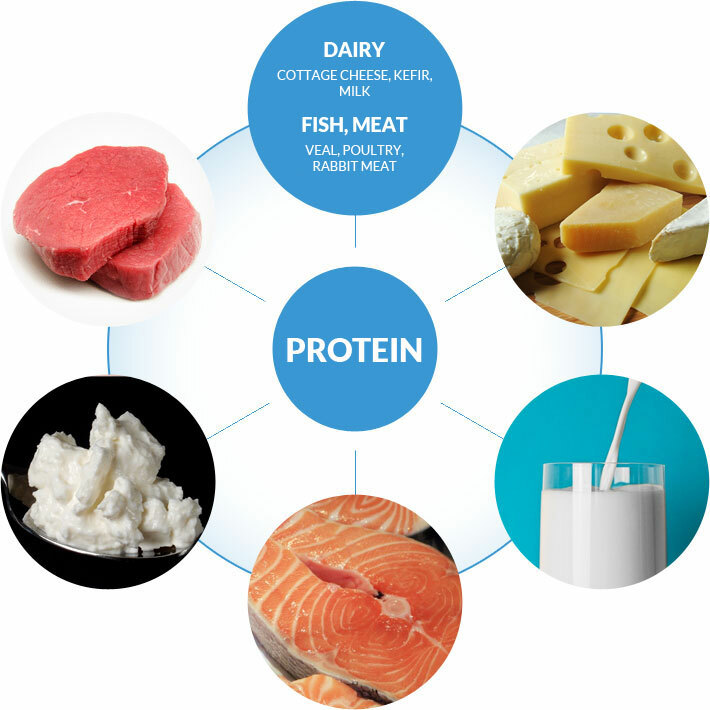 The human body produces protein on its own, however, it is necessary to include protein-rich ingredients in the diet. Our diet should primarily contain wholesome protein, so mainly originating from animals. We should therefore provide our body with dense dairy products - cottage cheese, kefir, milk. Milk products are also rich in calcium, which together with phosphorus builds bone structure. Ingredients rich in whole-grain protein are also fish and meat such as veal, poultry, rabbit meat. Choose lean meat that does not contain large amounts of unfavorable fat. Collagen is the main connective tissue protein that provides the right cushioning and elasticity to the joints. Collagen forms the structure of tendons, ligaments, joints and intervertebral discs. The strength and resistance of cartilage depends from it. Proper collagen suppression prevents the occurrence of autoimmune diseases associated with the destruction of articular cartilage. This increases joint mobility and flexibility. Collagen is an indispensable bone building ingredient. Vitamin C provided better absorption of collagen. Unfortunately, as the body ages, it produces smaller amounts of collagen. An incorrect diet, past illness, unhealthy lifestyle or very intensive sports training reduce the ability of the body to self-replenish collagen deficiencies. Collagen deficiency directly translates into insufficient production of synovial fluid in the joints. When this happens, patients complain about the pain in joints and problems with movement and physical activity. Low levels of vitamin D in the serum can cause bone and joint pain and muscle weakness. Many patients with rheumatoid arthritis (RA) experience low vitamin D levels. RA is the most common chronic inflammatory disease of the joints. It is a connective tissue disease that manifests itself in symmetrical arthritis as well as the occurrence of extra-arterial changes and organ damage. It is a very common disease that affects between 0.5 and 1% of the population of developed countries. Increasingly, the necessity to use vitamin D in the prevention of autoimmune diseases, including rheumatic diseases is indicated. Auto aggression diseases are caused by disorders in the immune system. The body begins to produce antibodies that are directed against its own cells and tissues. Therefore, supplements of vitamin D in the body can reduce the risk of rheumatoid arthritis. The human body can replenish vitamin D deficiency by providing adequate and safe sun treatment. 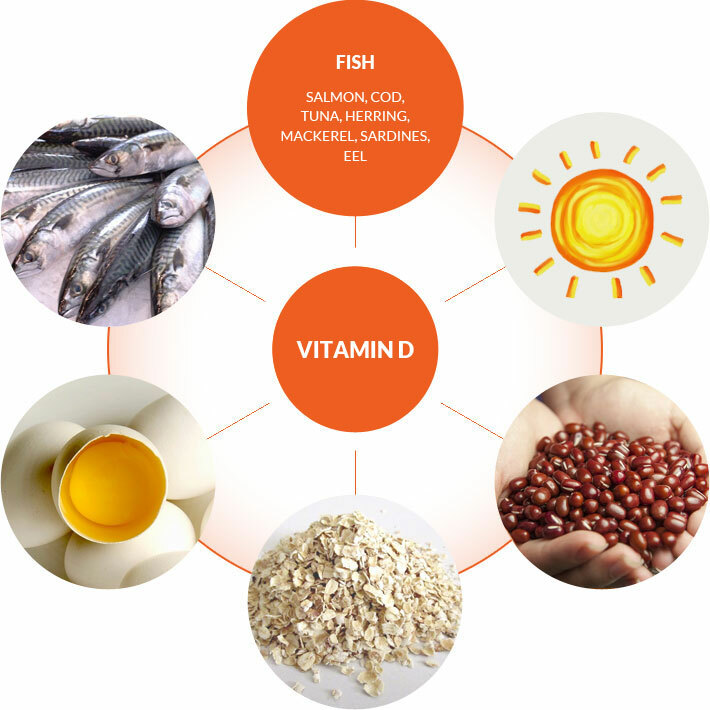 The endogenous synthesis of vitamin D in the skin caused by sunlight is the best way to provide vitamin D. Epidemiological studies confirm the association between vitamin deficiency in people living in the area and increased incidence of autoimmune diseases. Unfortunately, insufficient sunlight in Poland makes most Poles have too low vitamin D levels in the body. Vitamin D supplementation may be hampered by the use of laxatives and alcohol, and also by the use of long-term low-fat diets. Excess vitamin D can cause various types of illnesses, so it is recommended to check the recommended doses of vitamin D in the body in advance. Omega-3 fatty acid is an extremely valuable nutrient that alleviates the symptoms of rheumatoid arthritis. It reduces discomforts such as pain or stiffness that are characteristic for rheumatic diseases. Omega-3 improves the absorption of calcium, so it is recommended by doctors for the treatment of osteoporosis. In addition, it strengthens the immune system, protects against kidney disease, and reduces the risk of cancer. Omega-3 has an extremely beneficial effect on our heart and cardiovascular system. Regular intake of omega-3 fatty acids reduces the risk of developing atherosclerosis. This acid supports various functions of the nervous system, especially the brain and the visual organs. It improves mood and reduces the risk of depression. Supplementing the diet with antioxidant-rich products protects the cells from free radicals that can adversely affect joints. vitamin C - plays a very important role in the human body. It stimulates the production of collagen, supports the reconstruction of connective tissue and cartilage. Vitamin C is involved in the synthesis of steroid hormones and carnitine, which facilitates healing of wounds and accelerates bone growth. Vitamin C deficiency interferes with collagen production, which directly affects arthritis. Vitamin C is found in large quantities in vegetables (parsley, brussels sprouts, broccoli) and in fruits (currant, strawberry, kiwi). vitamin E - has anti-inflammatory effect. It has antioxidant properties that protect the body against metabolic diseases. Vegetable fats (walnuts, rapeseed oil), as well as vegetables, are the main source of vitamin E recommended for arthritis. A deficiency of any of the nutrients listed above can cause joint weakness or aggravation of joint inflammation. Therefore, proper dietary supplementation is essential. Hyaluronic acid - is a component found in human tissues, including cartilage tissues and synovial fluid. It is one of the main components responsible for the condition of the joints. Hyaluronic acid reduces friction between the cartilage planes and protects them from damage. This acid is naturally produced by the human body, however, with age it begins to decrease. People with RA suffer from a reduced amount of produced acid. Hyaluronic acid deficiency causes a decrease in the viscosity of the synovial fluid, which limits the ability of the joints to absorb the shock that articular cartilage is administered. Its absence is clearly noticeable due to severe pain. 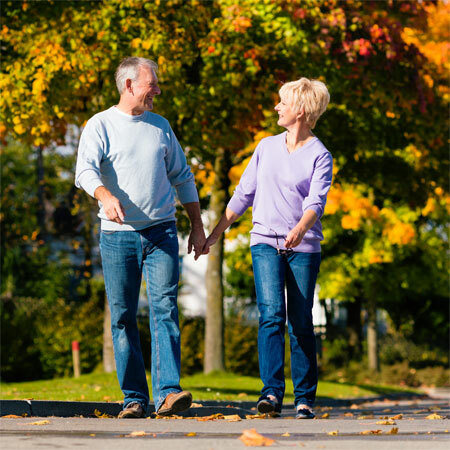 If you are diagnosed with arthritis, it is important to take proper nutritional supplements. Supplementing hyaluronic acid in the form of a preparation can re-establish the properties of the synovial fluid and improve the mobility of the joints. Chondroitin - one of the most important constituents of endurance and joint performance. Chondorithin fills intercellular spaces in connective tissues. The properties of this substance are extremely valuable for maintaining good joints or restoring their mobility. Research confirms the positive effect of chondroitin only in combination with hyaluronic acid. The combination of both of these ingredients is Hyalutidin, a highly effective formulation, proven in a large number of cases in patients suffering from arthritis. 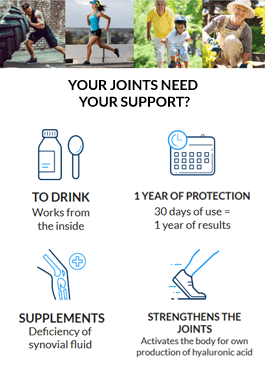 The unique formulation contains essential components for your joints - hyaluronic acid and chondroitin, which complement each other and restore the natural function of the joints. The Hyalutidin preparation supplements the articular cartilage and alleviates symptoms of osteoarthritis. It also improves the biochemical function of cartilage tissue. Taking liquid supplements is definitely more convenient than taking tablets. The joint supplement is recommended for all people who have inflammation and joint pain. This preparation is recommended for seniors, who are often diagnosed with insufficient amount of synovial fluid. Dietary supplementation is also recommended for those who perform heavy physical work or spend hours in one continuous position (constant, multi-hour work on the computer), drastically exposing their joints to overload. Jobs that consist of repeating the same activities in an uncomfortable position are highly burdensome. Supplementation may be necessary in the diet of professional athletes. These people often overload the joints, which in turn can cause their injuries or chronic inflammation. The main enemies of the joints are all kinds of burdens. Therefore, joint strengthening should be considered in a situation of the obesity situation of a patient in whom excessive weight may disadvantagedly overload the joints and thereby reduce their endurance. Convalescence after orthopedic procedures may also require supplementing with appropriate formulations. In this case, a properly selected supplement will not only alleviate swelling and joint pain, but will also provide faster recovery. Hyalutidin is the only effective supplement to improve joint health. 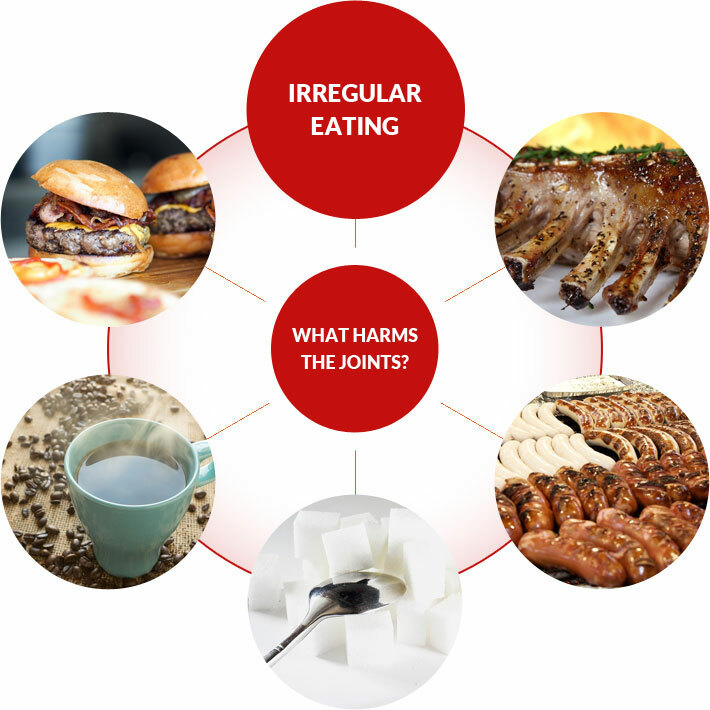 WHAT TYPE OF FOOD HARMS THE JOINTS? Fast food (burgers, packet soups, crisps, etc.) contain very large amounts of preservatives and saturated fatty acids. These ingredients can enhance inflammatory reactions in the body. Fast food foods are most often very calorific foods that directly affect weight gain. Being overweight greatly influences the treatment of the patient. It is also the cause of low levels of physical activity, which prolongs the process of reaching full fitness in arthritis. Strong coffee and tea - contribute to the loss of calcium from the body and limit the assimilation of protein, which adversely affects the bone-joint system. Sugar and products containing high amounts of sugar (e.g. sweetened beverages, biscuits, sweets) - cause autoimmune and immune disorders, which can cause many diseases, including arthritis. Excessive sugar acidifies the body and contributes to the loss of calcium, which is used to maintain proper acid-alkaline balance. Sugar also causes loss of connective tissue density and changes the structure of collagen and can contribute to its deficiency. Highly processed meat products (sausages, meat) can contain many artificial ingredients and preservatives. Products rich in animal fat are not recommended in a diet for sick joints. If you want to supplement your diet with animal protein, try to choose lean meat, preferably high quality (free of antibiotics and preservatives). One should also remember to eat regularly. It is advisable to consume frequent meals (at least every 4 hours) in smaller portions. The last meal during the day should be eaten not later than 3 hours before going to bed. People with arthritis should pay particular attention to the symptoms that are caused when they consume particular products. Many products can cause allergies or worsening of symptoms.